Secure BlackBerry calls with Cellcrypt | BlackBerry Blast! Cellcrypt, the leading provider of secure mobile voice calling, announced that Cellcrypt Mobile is available now for BlackBerry® smartphones. Cellcrypt Mobile introduces end-to-end real-time encryption to prevent private conversations from being compromised, enabling individuals within corporations and governments to converse in a highly secure manner without the need for specialised equipment or the expense of new infrastructure. "Voice is the last unsecured data service," commented Jeremy Green, Practice Leader Mobile, at industry analyst Ovum. "Security of mobile devices is a hot topic in the industry, and up until now, high security voice calling has only been available using specialized military-specification equipment, but solutions from companies such as Cellcrypt make this easily accessible to all." 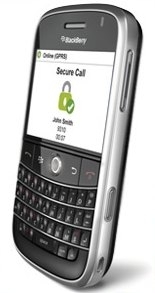 Cellcrypt operates with an easy-to-use interface on commercially available BlackBerry smartphones and does not require specialized equipment. Cellcrypt users will be able to benefit from the end-to-end security of their mobile voice calls, along with all the features of their BlackBerry smartphone.